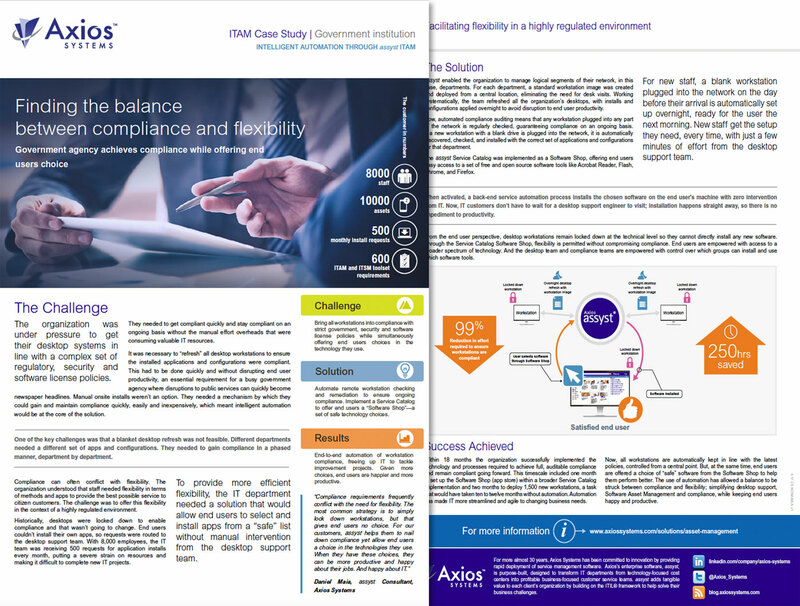 With assyst, Equalit is able to provide continuous professionalization of its IT Service Management in order to improve the quality of their ICT service to end users, whilst ensuring ITIL® best practices are followed. 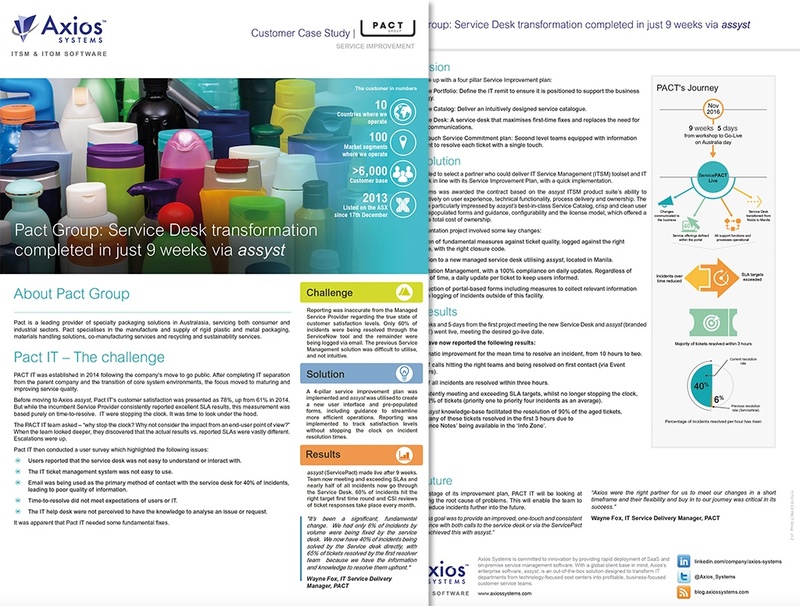 Service Desk transformation completed in just 9 weeks with assyst. 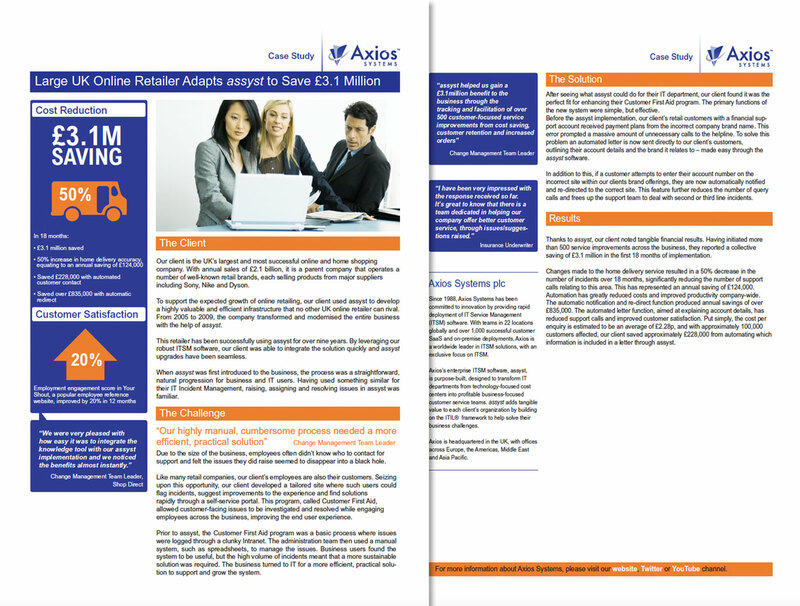 Achieved scoping to go-live in 106 days. 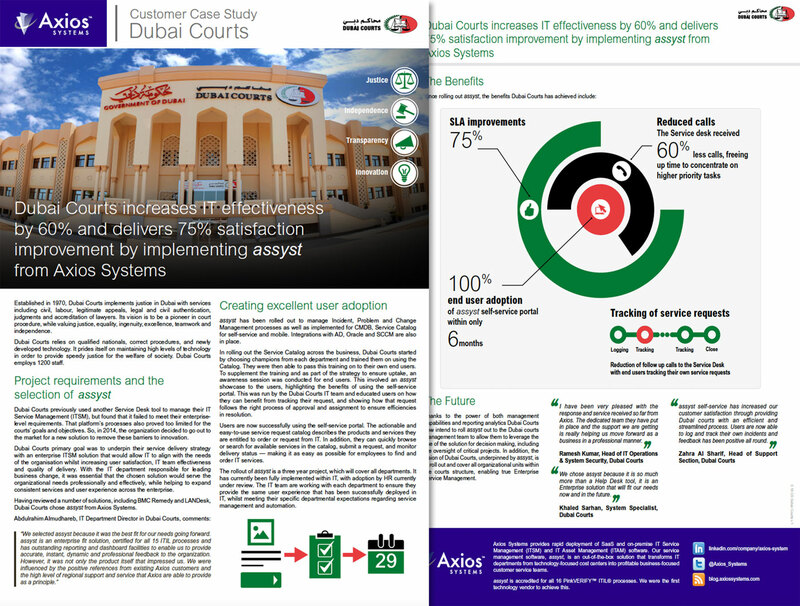 Dubai Courts boosts IT performance by 60% and IT customer satisfaction by 75% with assyst. 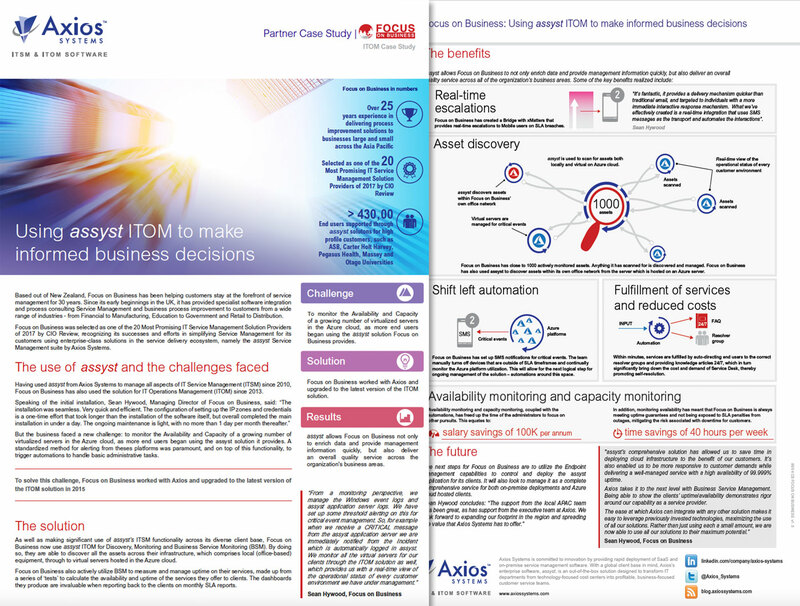 assyst gives Focus on Business real-time access to enriched infrastructure and operations data and analytics for better, faster decision-making. 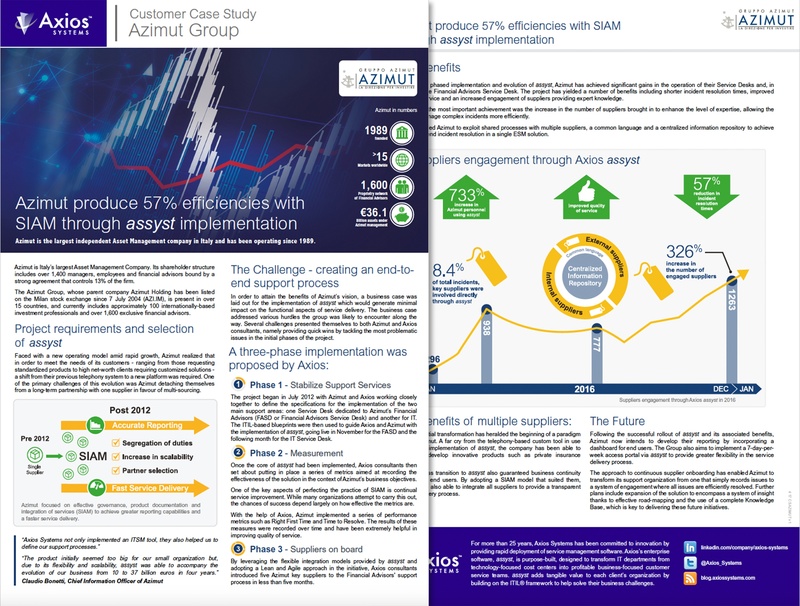 assyst's flexibility and scalability helps Azimut evolve business from €10Bn to €37Bn in four years. 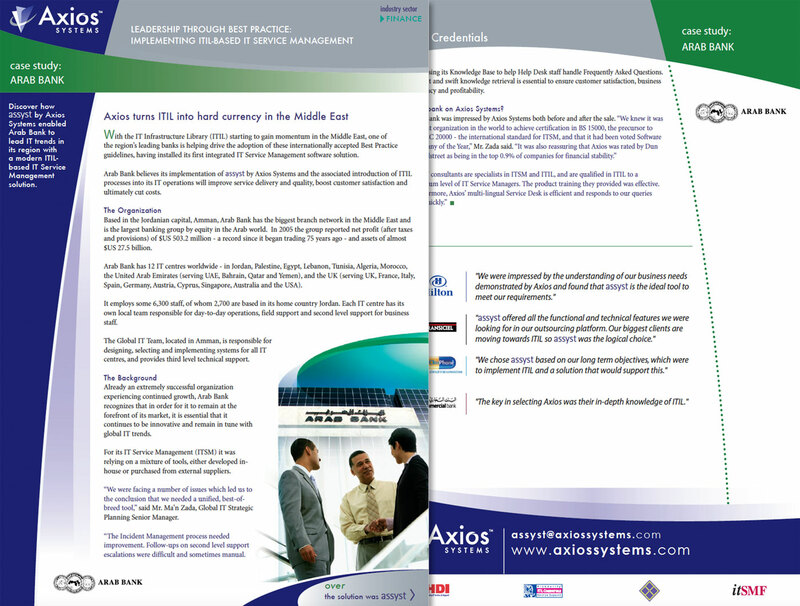 Cloetta replaces HP with assyst to get global visibility and control over IT services, infrastructure, and operations. 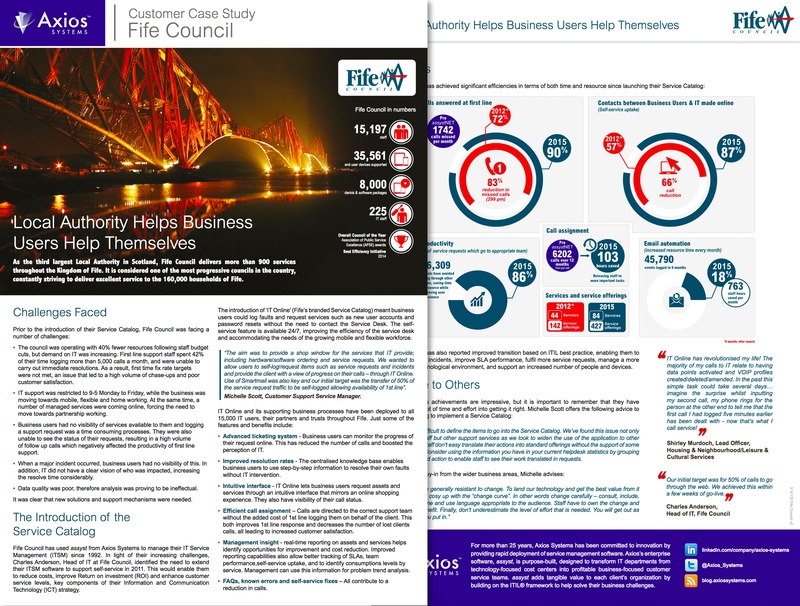 Shared services model delivers 60% efficiency boost and a 40% increase in IT customer satisfaction. 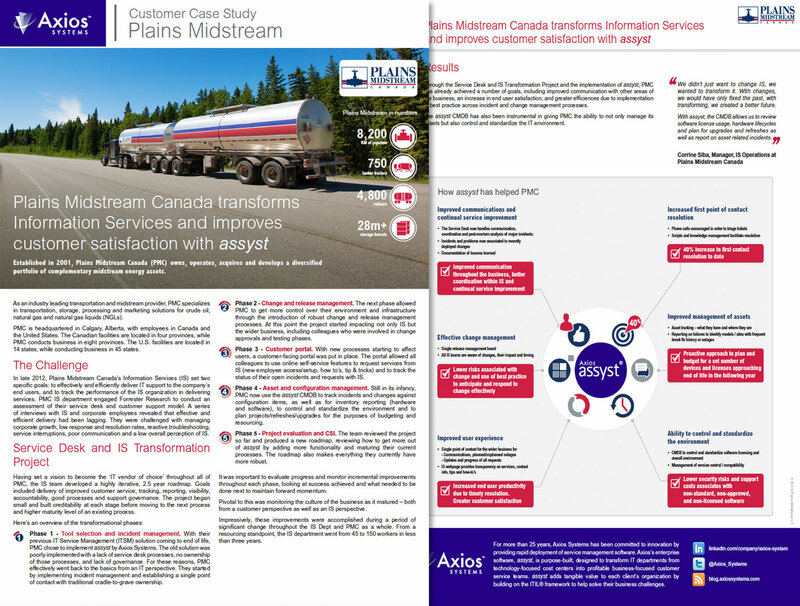 Energy giant transforms IT services and improves IT customer satisfaction with assyst. 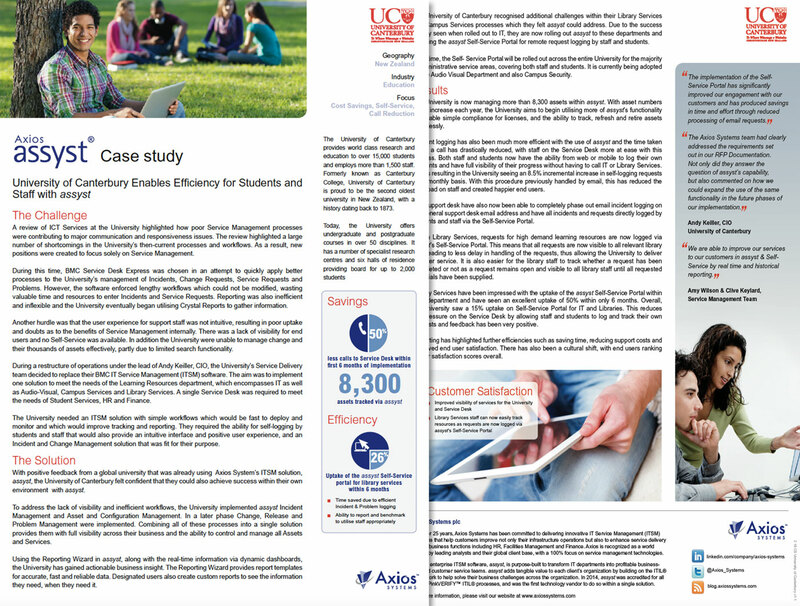 University replaces BMC Remedy with assyst and reduces service desk calls by 50% within 6 months. 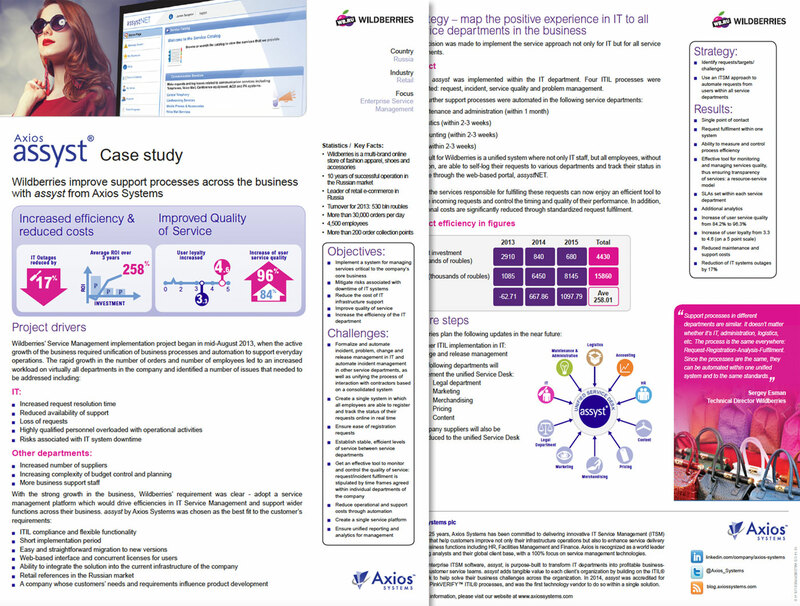 Using assyst to improve services in IT, HR, Facilities, and Finance. 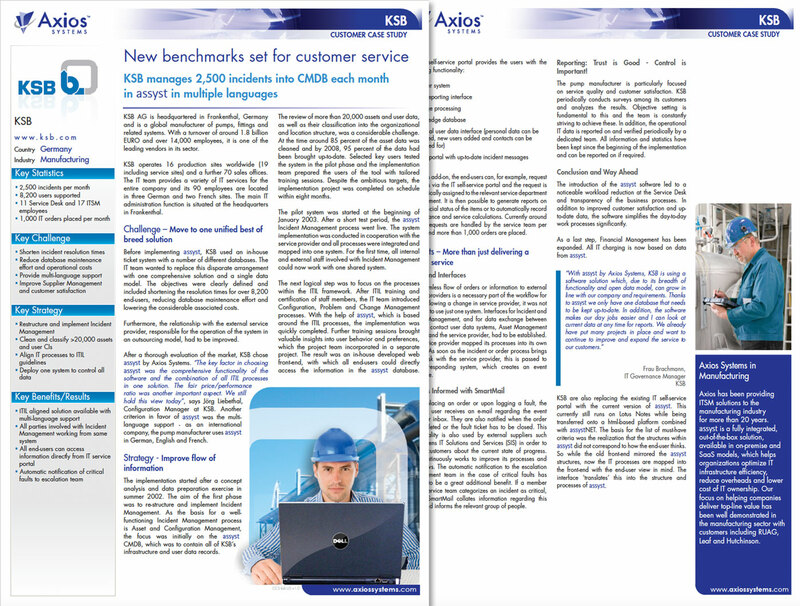 BRIC service desk increases customer satisfaction for more than 30,000 users with assyst. 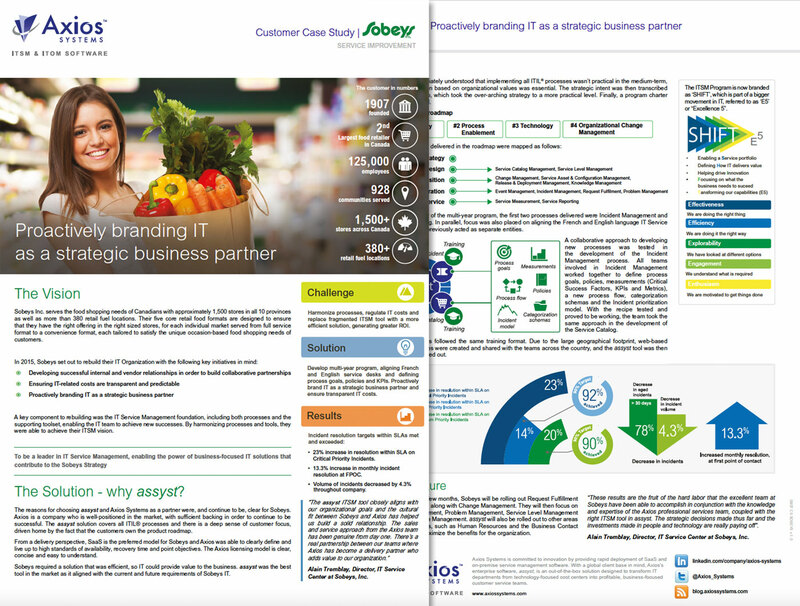 Retailer achieves 258% ROI over 3 years with assyst. 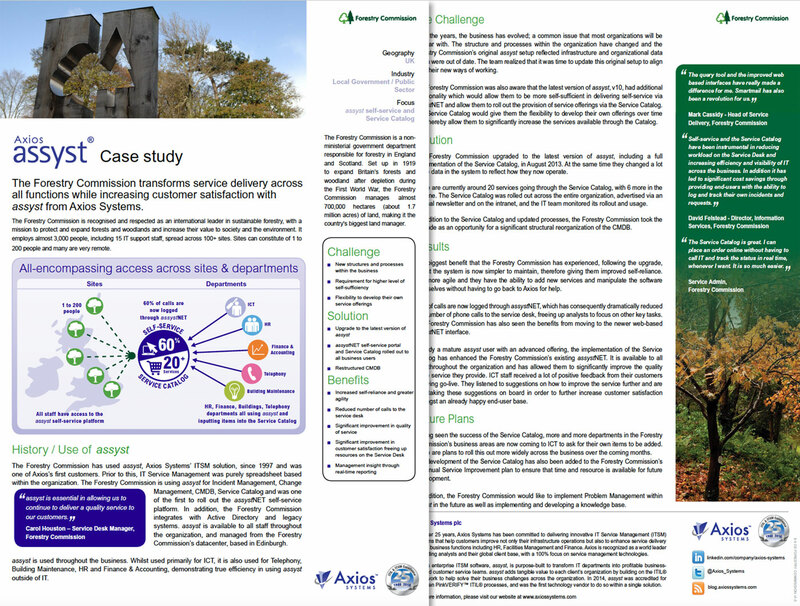 Forestry Commission transforms services across all functions and boosts customer satisfaction with assyst. 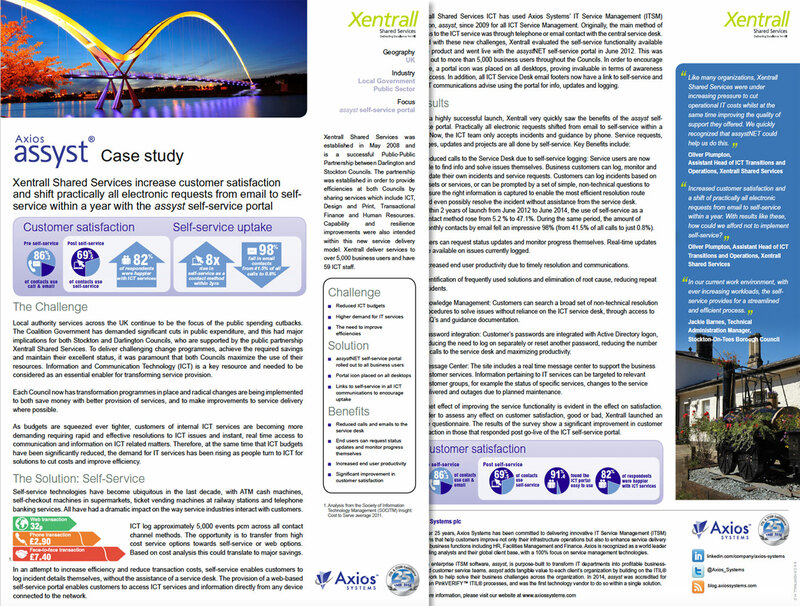 Xentrall moves 69% of incidents and requests to end user self-service portal: customers now happier. 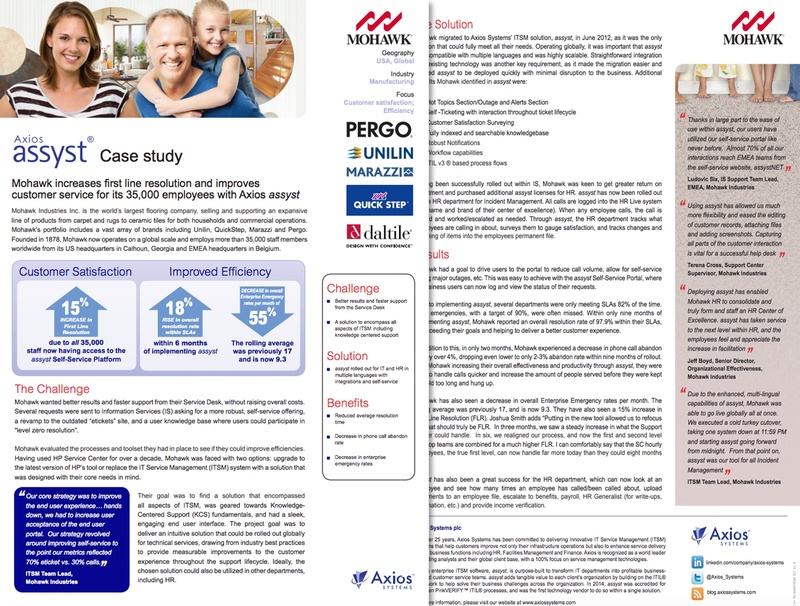 Mohawk increases first line resolution and improves customer service for its 35,000 employees with assyst. 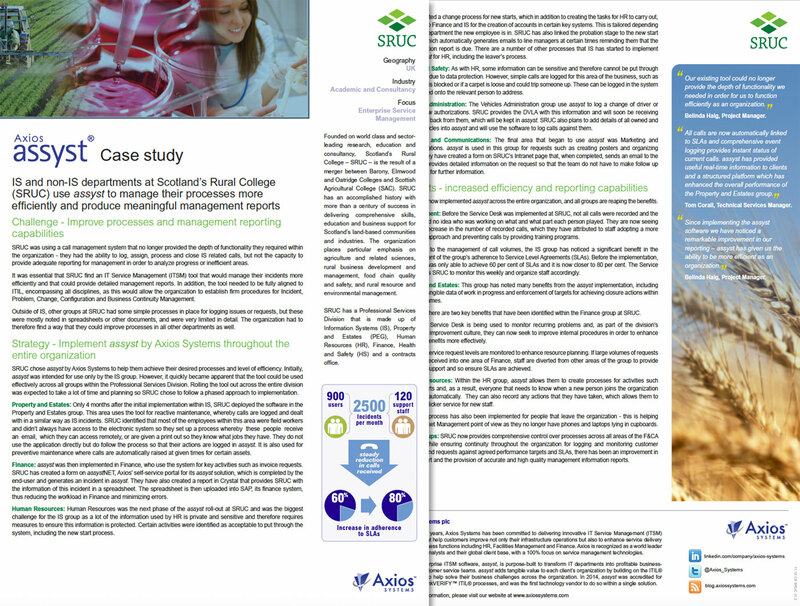 Scotland's Rural College gets central visibility and control over IT I&O processes, data, and analytics with assyst. 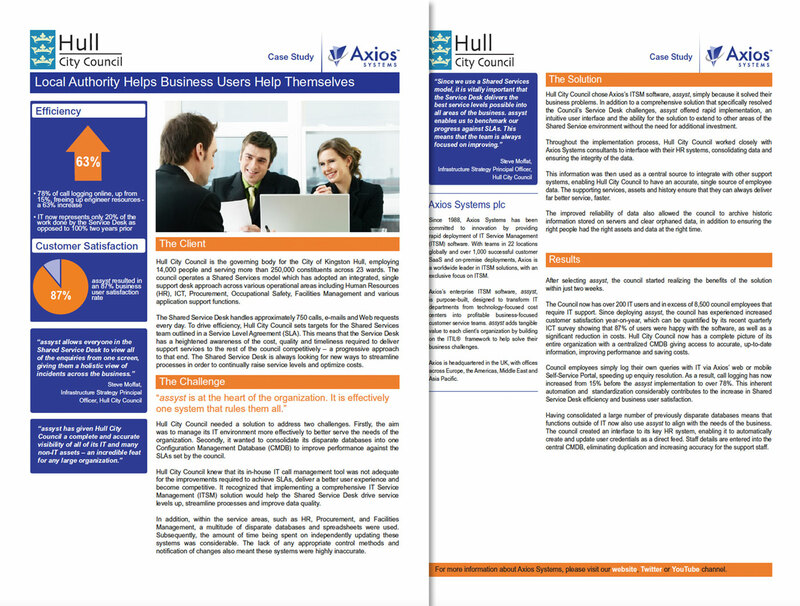 Hull City Council rolls out cross-functional service desk support to entire organization of 14,000 people. 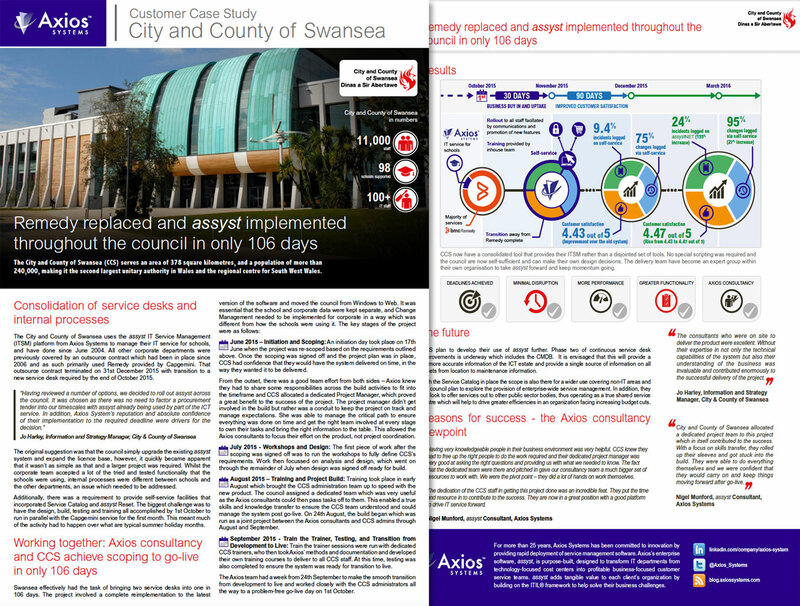 £3.1 million saved in the first 18 months with assyst. 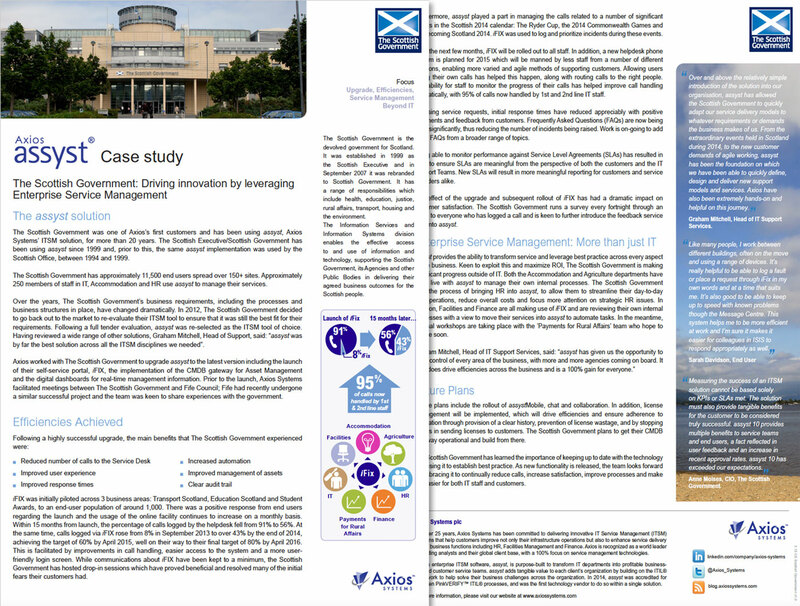 Leading Scottish council deploys service catalog to 16,000 employees with assyst. 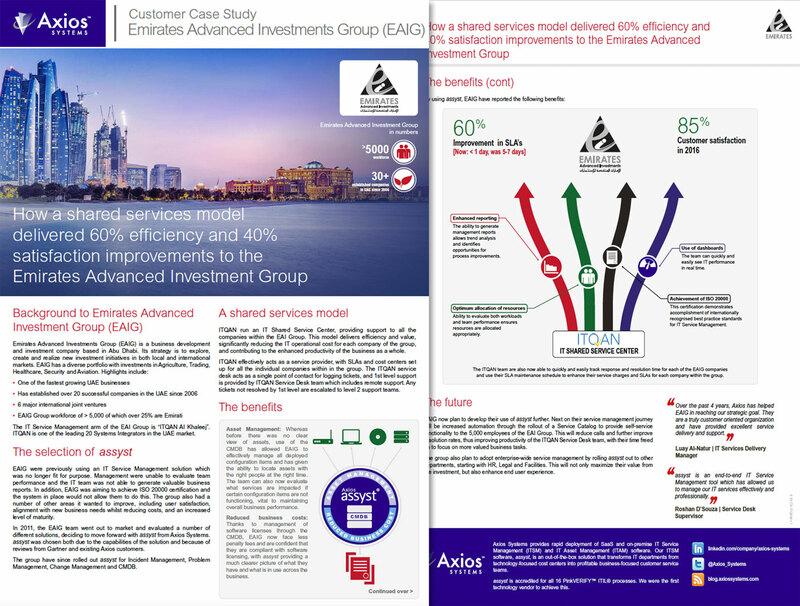 English council transforms IT services with assyst. 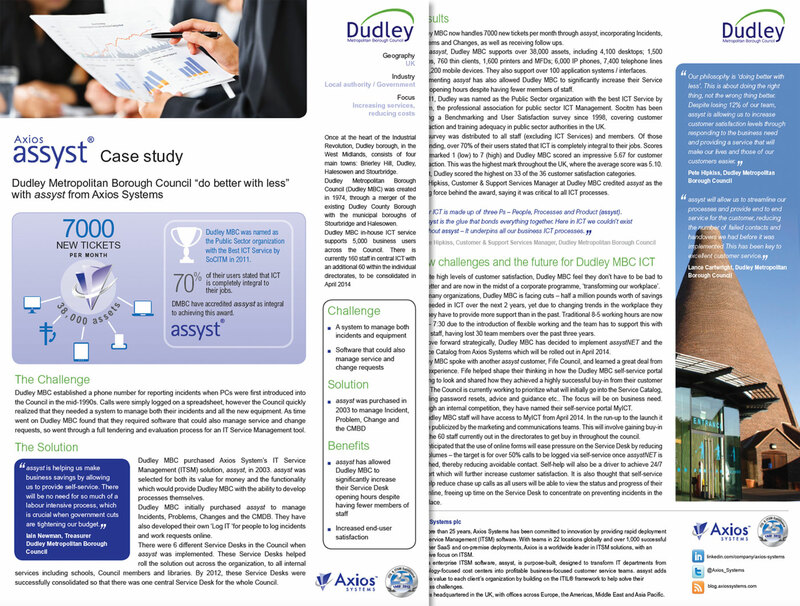 assyst helps Dudley Metropolitan Borough Council "do better with less". 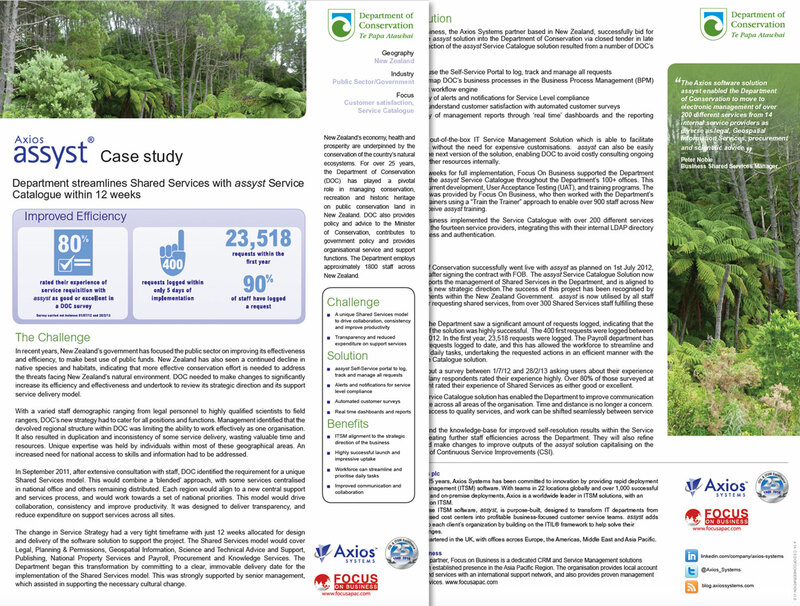 "We were looking for a flexible system which encompassed all our activities." 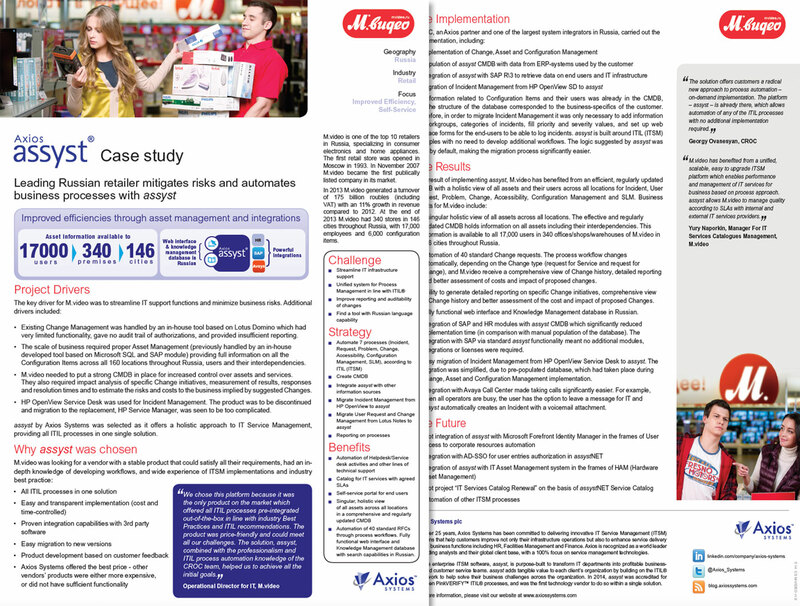 Russian retail giant automated business processes with assyst. 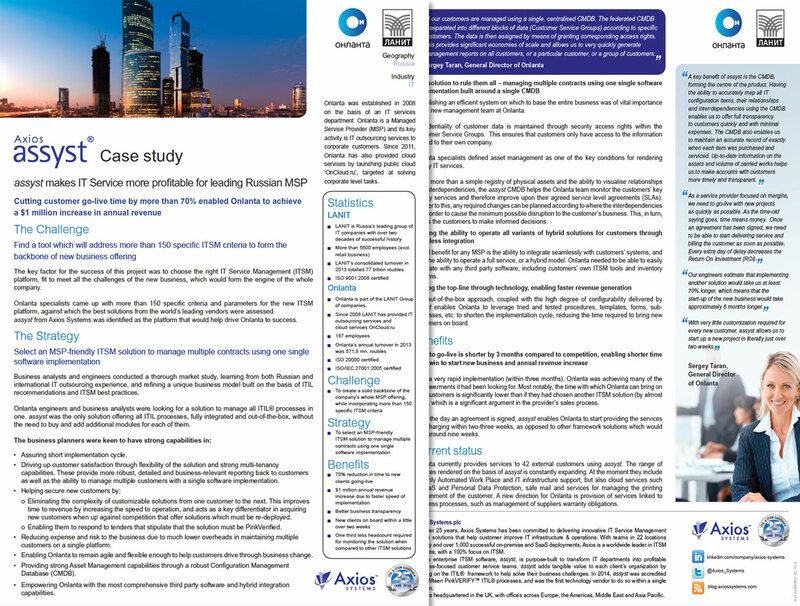 Improved IT agility reduces customer go-live time by 70%, enabling Russian MSP to achieve a $1m increase in annual revenue. 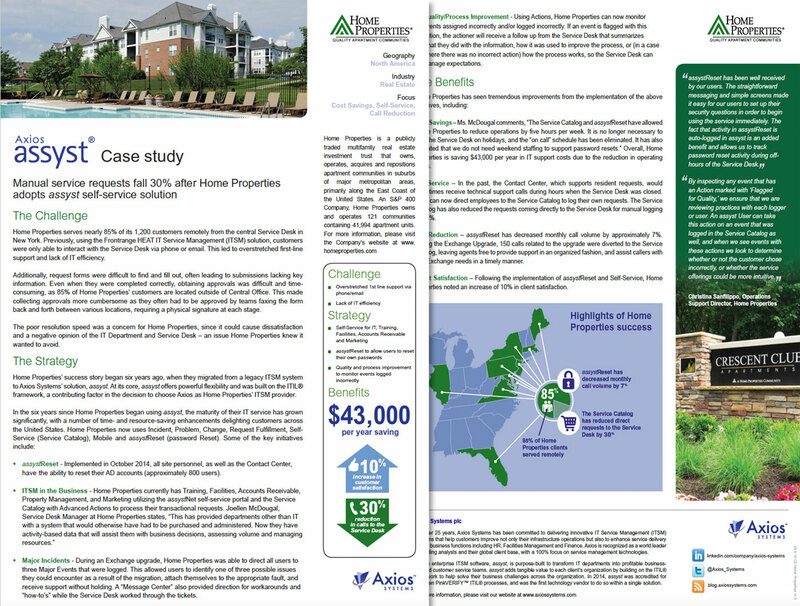 National real estate giant improves IT maturity and the end user experience with assyst. 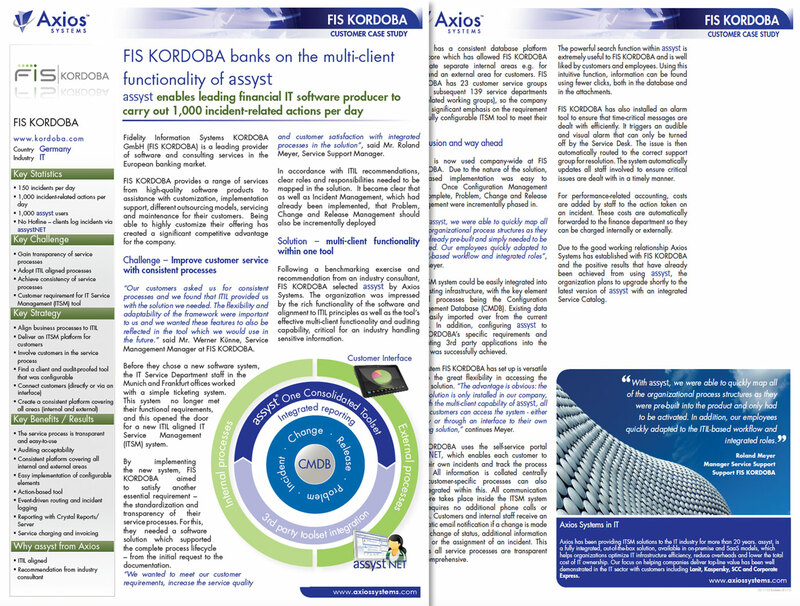 Full-service bank tames the complexity of banking IT and accelerates innovation with assyst. 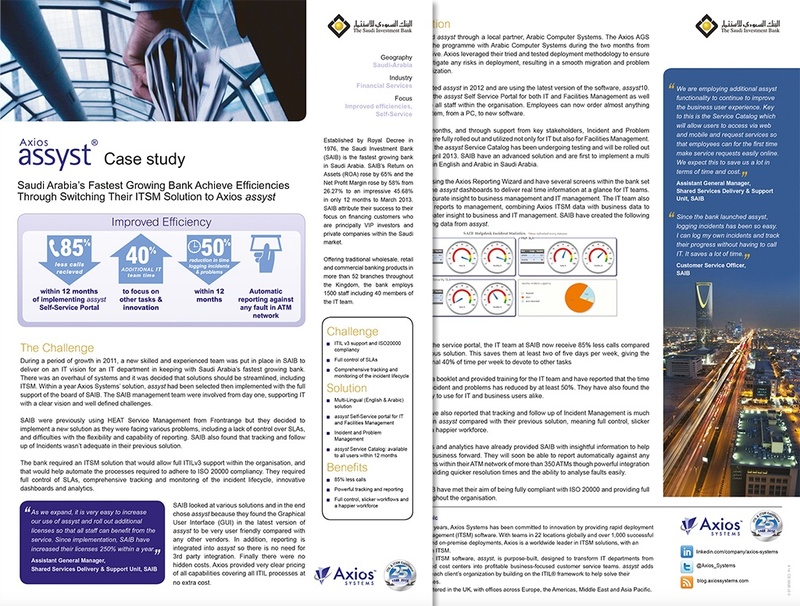 Saudi Arabia's fastest-growing bank reduces service desk calls by 85%, releasing 40% of IT team time to focus on innovation. 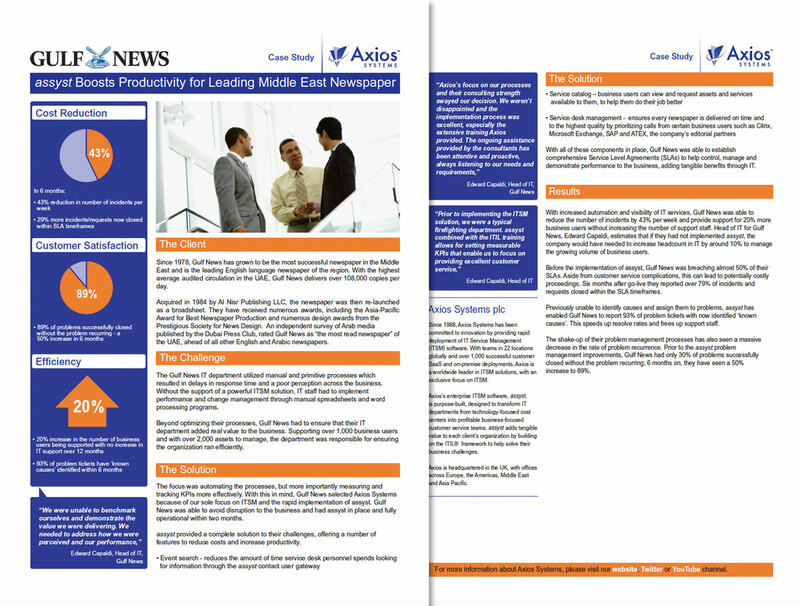 Leading newspaper boosts IT maturity and IT customer satisfaction through better visibility, insight, and automation. 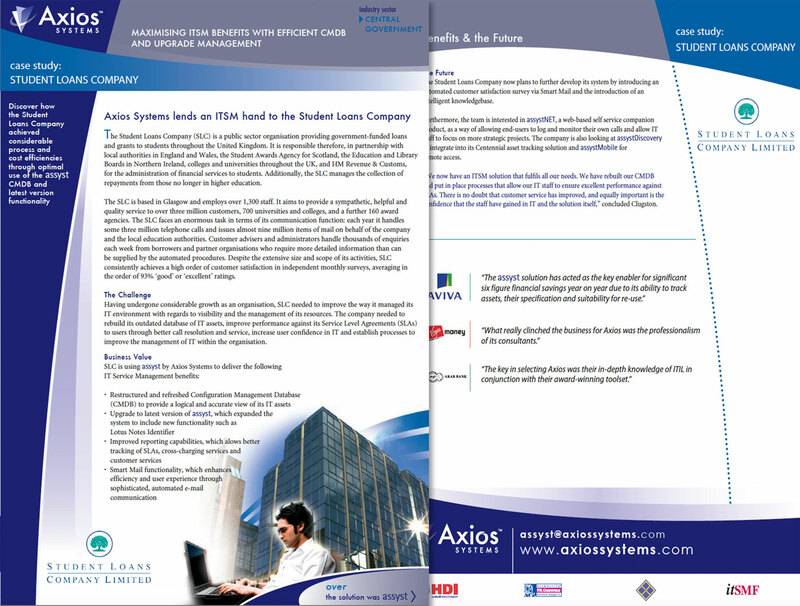 Leading bank unifies IT management to achieve complete visibility and control with assyst. 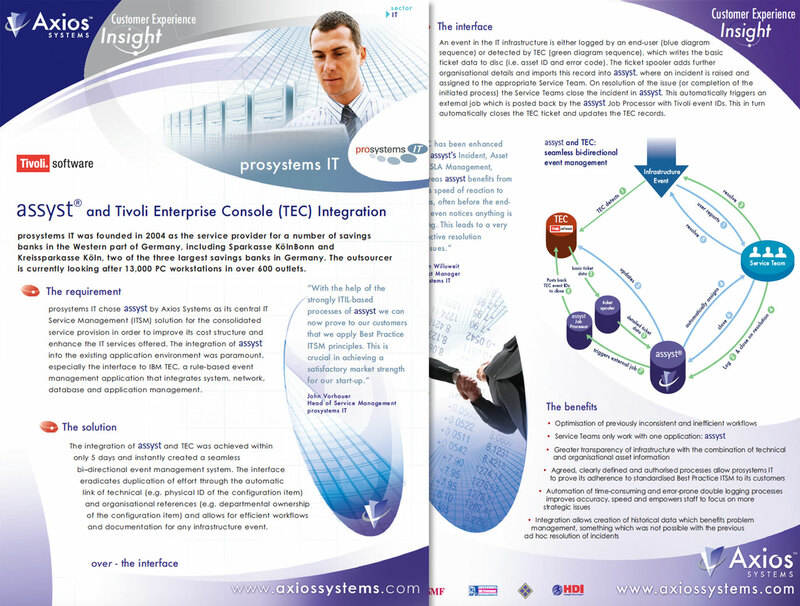 prosystems IT chose assyst as its central IT Service Management (ITSM) solution for consolidated service provision. 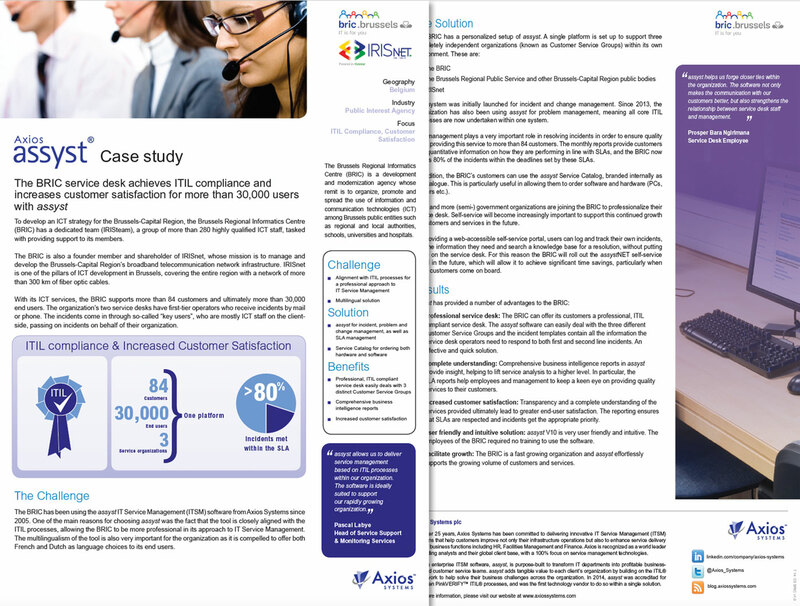 Manufacturer solves multi-language IT support issues with assyst. 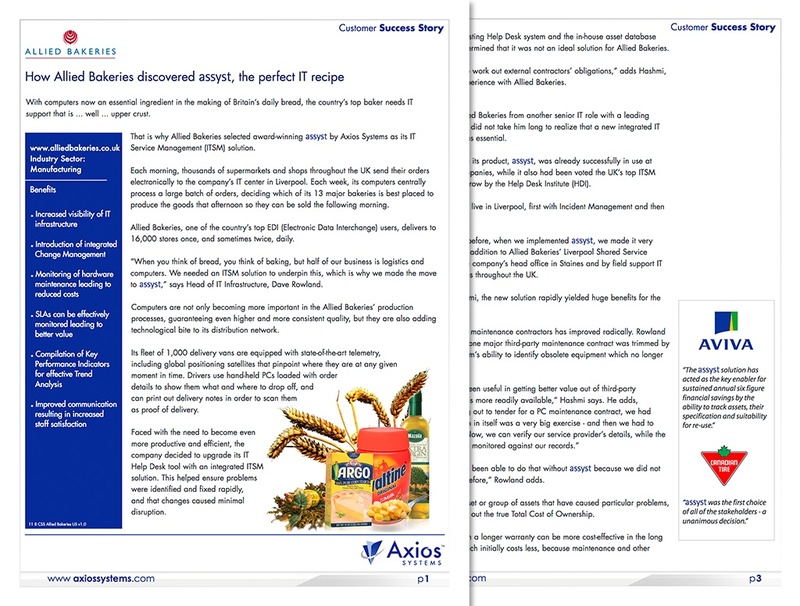 Software & services provider selects assyst for multi-client support, auditing, and data security. 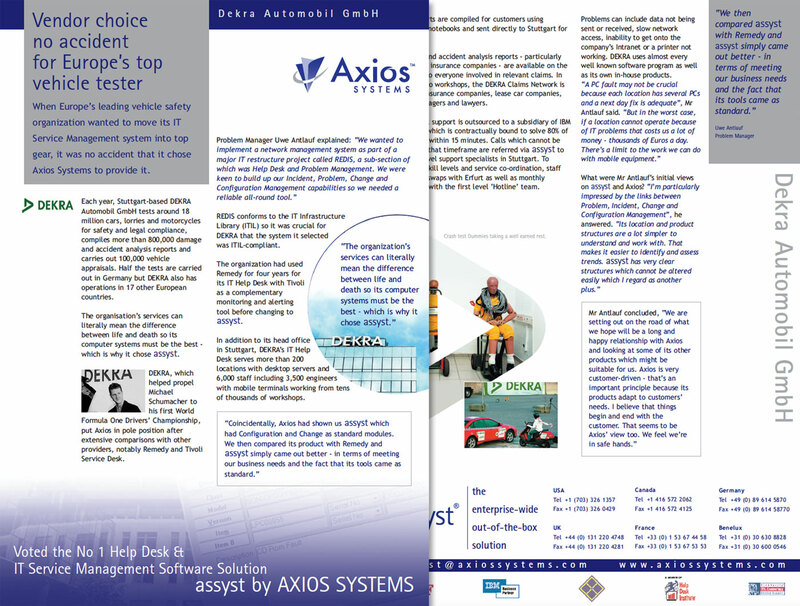 Europe's leading vehicle safety organization replaces BMC Remedy with assyst as a more fit-for-purpose solution. 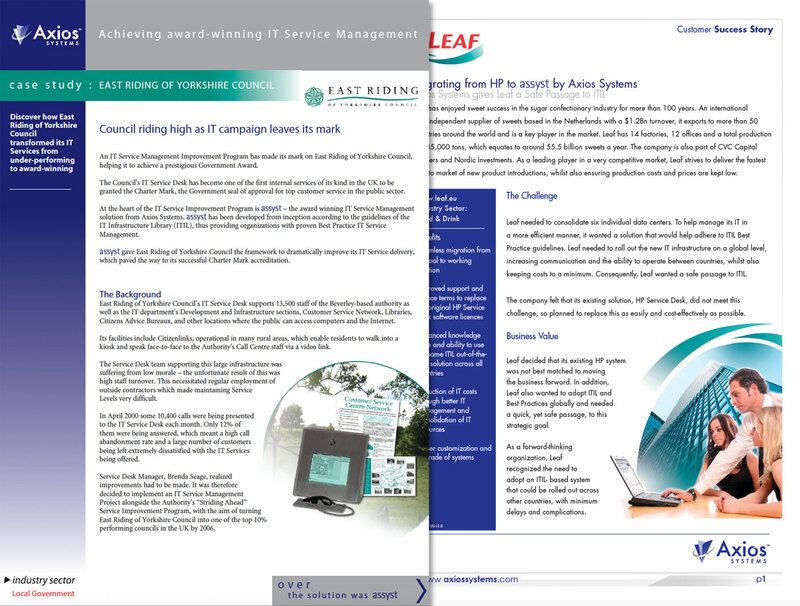 LEAF consolidates six help desks into one consolidated service center with assyst. 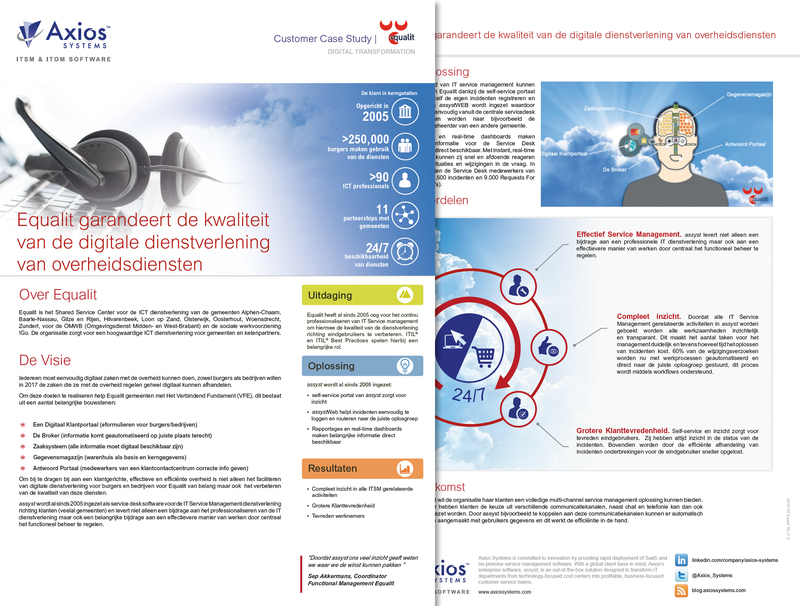 DOC moves 90% of staff to digital service catalog in just 12 weeks, improving the perception of IT. 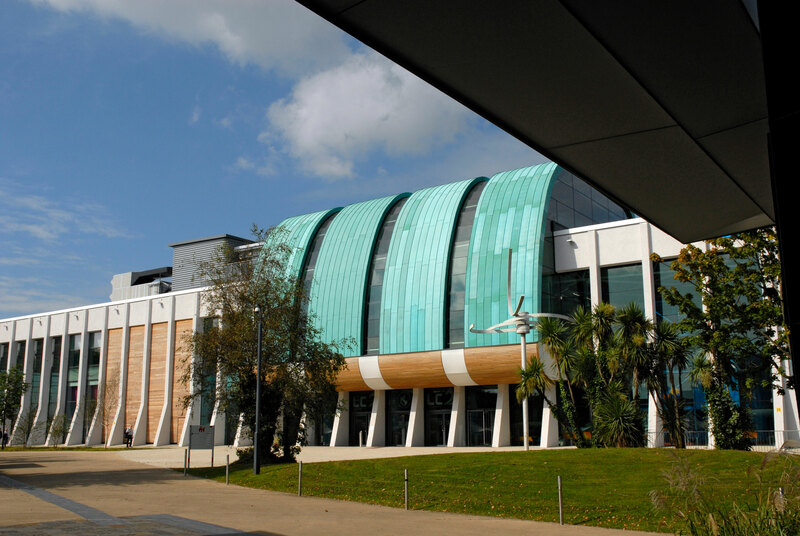 SLC selects assyst to support growth, agility and innovation. 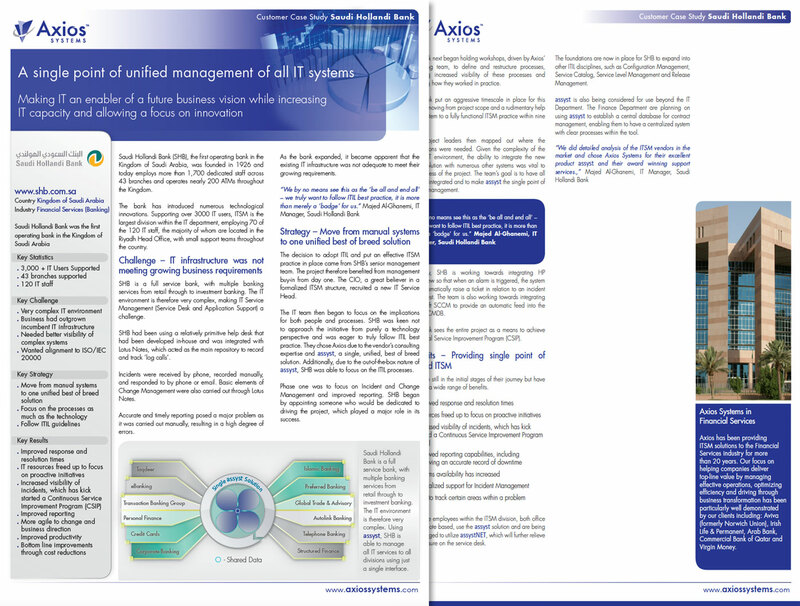 Central visibility and control transforms IT operations management with assyst. 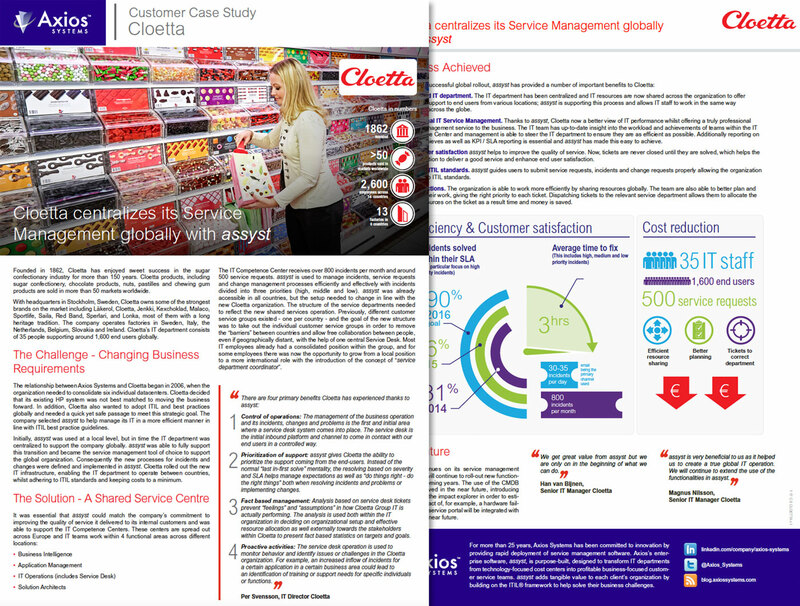 Major retailer transforms IT to become more transparent and business-aligned. 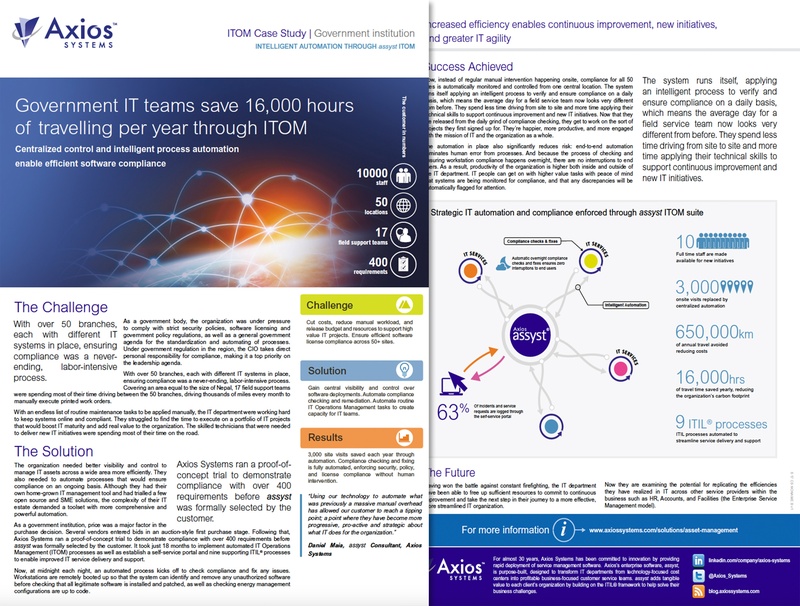 Government agency achieves compliance while offering end users choice. 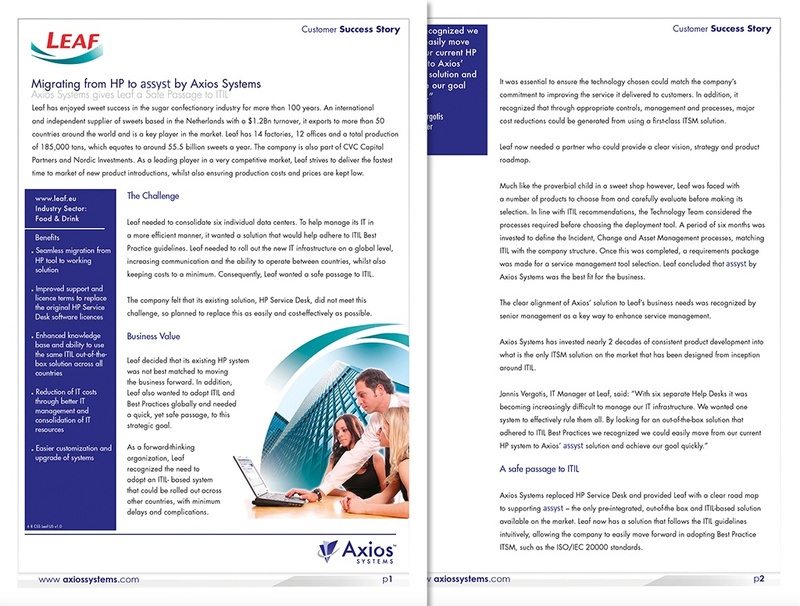 © Axios 2019. All Rights Reserved.